In this post, I will be providing you with my review of Social Jukebox that is thorough, informative, and honest. So, what is Social Jukebox? My review will answer that question for you. That was my question when I first heard the name. It is a social media management tool. When online marketing, social networking is a requirement for success and Social Jukebox is an awesome tool that helps you manage your social media accounts. However, to build your social media presence, you must be responsive, and some platforms move faster than others; one is Twitter. Social Jukebox allows you to manage your Twitter, Facebook, and LinkedIn social media accounts effectively so that you stay relevant on your social media platforms. So, without further ado, let’s get to the review of Social Jukebox, shall we? Social Jukebox is a social media scheduling platform that makes it possible for you to schedule your content and posts on your social accounts which include Twitter, Facebook, and LinkedIn. This program is so powerful that you can link up to 200 social accounts to it and load your jukebox with up to 20,000 posts for each account. Now that’s a lot of content! If you do the math that over 4 million posts that you can store on this platform. Check out the orientation video now. Library where you can get content created and curated by fellow users and Social Jukebox which can be download for personal use. Who is Social Jukebox For? Social Jukebox is for business owners, entrepreneurs, bloggers, website and domain owners. Really, any individual who creates content and uses social media who is looking to save time can benefit from the services that Social Jukebox offers. We all know how time-consuming that managing your social media accounts can be, this platform is for those that do not have the time to spend hours managing your social media. Click here now to get started. Social Jukebox has a Contact Us form where you can submit emails directly to the owner of the business with your concerns, questions, and comments. In addition, there is also a help menu when you enter your jukebox. You may be thinking “what is a jukebox?” A jukebox is where all of your content is stored prior to it being sent out. 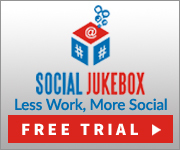 I have posted a video for you below so you can see first hand how to use jukeboxes in Social Jukebox. So you see, Social Jukebox makes it so much easier to get all your tweets scheduled, loaded into the jukebox and sent out at your discretion. Using this tool will save you so much time that you can have more time to do more important things such as write more high-quality content! Click here now to join Social Jukebox! As with many other services and companies, Social Jukebox has an FAQ section where you can get answers to the most frequently asked questions. The owner does support these services. In addition to being able to schedule your tweets and posts, there is a library full of content that you have access to. When you run out of ideas for your new content this is a place that you can go to get new ideas or even download content for you to share on your own website or domain. What I really like about this tool is that it ensures that you will never struggle to remember which posts you have shared and ones still needed to be shared; Social Jukebox does this for you. I believe that this tool will prove beneficial and improve your social presence by keeping your contributions consistent. Social Jukebox’s prices are very reasonable and are designed to fit into all types of budgets. There are 4 different subscription plans; Advanced, Pro, Business, and Ultimate. The Pro plan is the most popular out of the 4. The prices range from $19.99/month to $99.99/month. You can also pay yearly for savings, the prices are $199.90/year to $999.90/year. Below you can check out the various subscription plans, features, and prices. In my opinion, Social Jukebox is an excellent program for automating your Twitter, Facebook, and LinkedIn posts, hashtags, and quotes. Social Jukebox also has a feature that allows you to schedule thank you posts to your newest followers. 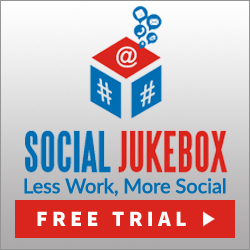 Overall, Social Jukebox saves you time for you to complete other tasks for your business. This concludes my Social Jukebox review. I hope you no longer have any questions about what is Social Jukebox and my review has answered them all. If you have any further questions please feel free to leave them below or email me at shwana@strategicmarketingaffiliates.com. Most of us starting out in affiliate marketing don’t have much of a budget. While this looks like an amazing tool for managing social account…really leveraging technology to expand your reach and let you focus on the important task of creating content…I’m concerned about the cost. Really, I guess I am trying to understand at what point you invest in a tool like this. Right now I’m build my sites and making no money, and my budget to invest is small. Do I need to spend $20 on this tool, or should I first do it manually, start making money, and then pay for the service when I can afford it? Thanks for the review and the help! You are right, usually those starting affiliate marketing don’t have a large budget, however, there is a small plan that is only $19.99/month. I know that over a years time this does add up. You don’t need to use a tool like this unless you have a lot of activity going on in your social media accounts. Since you have a small budget right now, wait until you start making money and then when you can afford it then I would recommend looking into a social media management tool. Really, if you can manage your social media accounts without automating your tasks then do so. However, when you have a lot of followers it is more efficient to use a tool that can help you respond to your followers immediately. It gets to be a lot when you have hundreds of followers and you need to like, +1, comment, and follow more people all on your own. Im sure you will know when it gets to be too much for you. I am glad you enjoyed my review. Thanks for taking the time to leave a comment. I wish you all the best success in your business. Thanks for the review on Social Jukebox. It sounds like a nice tool for my Facebook and Twitter accounts. It is easy to organize and schedule my post while the advanced plan is more than enough for my posts. I will give it a try and hopefully, it will work for me. Ilias. I am glad that you liked my Social Jukebox review. It is a pretty awesome tool. It really pays to have a social media management tool especially if you have a large following. I’m glad you are going to give Social Jukebox a try, let me know how it works out for you. Thanks for taking the time to leave a comment, Best wishes!